echo "My public IP:$(curl -s ipinfo.io/ip)"
2017-11-21T15:17:26.803090353Z Could not mount /sys/kernel/security. 2017-11-21T15:17:26.803107368Z AppArmor detection and --privileged mode might break. [SOLVED]"[: 1: [: Syntax error: end of file unexpected"
"[: 1: [: Syntax error: end of file unexpected"
check if your entrypoint.sh of the Docker image you using in this job. 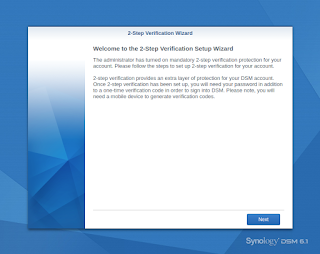 [SOLVED]Synology: "You have exceeded your emergency code limit. Please contact your system administrator"
Got stuck with "You have exceeded your emergency code limit. Please contact your system administrator" on your synology? Me too.. ..my mobile phone wend dead taking the Google Authenticator app with it and my trusty Synology DS411+II don't wont let me to log in without 2-auth. Here is my solution - I renamed the file. Login with your admin account via ssh. and logged me with my account via web interface and got this shiny 2-auth configuration dialog.